5 New City Road, Glasgow. 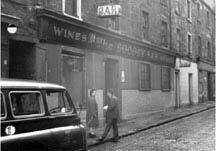 This old Cowcaddens pub was owned by Charles McGuire in 1868, he also two other pubs in the city, 9 Ferguson Street, many residents will still remember this old pub as the Socosy Bar, he also had a small tavern in Melville Court just off the Trongate, which was situated between the Candleriggs and Brunswick Street. When Charles passed away his son Edward took over the business. Edward added another public house to his small empire at 347 Garscube Road in 1891. This pub was situated at the round toll, where St. George's Road, Possil and Garscube Roads meet. A new semi-circular bar was installed with large whisky barrels sitting on the gantry, on entering, there were two small snug's on the left, further to the rear were small bar tables and at the rear of the premises another larger room capable for gatherings and social meetings. The main bar was roomy furnished with mirrors and ever-green plants, the walls were lined with oak panelling. A new family department (off-sales) was also added when the pub was refurbished. The pub on New City Road stayed in the McGuire family until the end of the First World War. 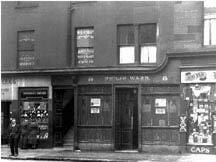 During the 1930s Philip Ward took over the pub and changed the name above the door. In 1960 James J Hargan was licensee, the pub was then known as the Normal Bar, James was the last licence holder, the pub was demolished around 1972, when the Cowcaddens got a face lift, due to the City Council's redevelopment plans. A Gorbals day outing 1965, left to right James Hargan, Charlie Sweeney, Citizen's Bar, J Dickson, Moss End Bar, Bellshill, A McAulay, Pig & Whistle, Mrs J Dickson, D Welsh, Teachers, Mrs Welsh, H Gallagher, the Tirconnail Bar, Mrs A McAulay, Peter Gallagher, The Havana Bar and A Ward, Shipbank, Saltmarket. Exterior view of the Socosy Bar, Ferguson Street. 1960s. Interior view of McGuire's Vaults, Garscube Road. The Normal Bar on the left looking up New City Road. 1963. 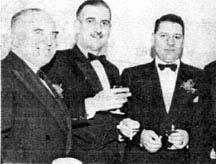 Left to right Mr James Hargan, Mr H Kerr, Mr A Hamilton. After "The Normal Bar" was demolished Jimmy Hargan moved the the "New Normal Bar" at Great Western Road. The pub was only open a few years before it too was demolished after a tenement when on fire, the Pub and the tenement and other shops were totally flattened shortly after the fire. Read more on the New Normal Bar Click here. Jimmy is set for a new life at 69. After half a century as a Glasgow property owner and publican Jimmy Hargan closes his cosy little Normal Bar this week at the now-almost derelict St George's Cross. And next Monday he takes off to Canada - as an emigrant, at the age of 69! "Who says life begins at 40?'' asks Hargan. "It begins when you want it to begin." Jimmy loins a son and nine grandchildren in Scarborough, Ontario, so he won't be exactly lonely. His wife is with him too.